Hyland Ridge is located on Pantops in between Ashcroft and Fontana. It is centrally located in Charlottesville. The neighborhood is home to some of the most beautiful views of the mountains and wonderful sunsets. Within Hyland Ridge there are many walking trails, ponds, and green spaces. 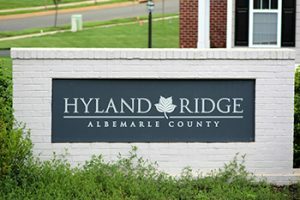 Hyland Ridge has multiple single family homes built on half acre lots. Homes in Hyland ridge are built by Southern Development and Craig Builders. Construction is still ongoing in Hyland Ridge.